I've been working on a Duality plugin for a week that is kind of cool. It enables you to create geometry by placing nodes (kind of like the rigid body editor) and place different textures for different parts. 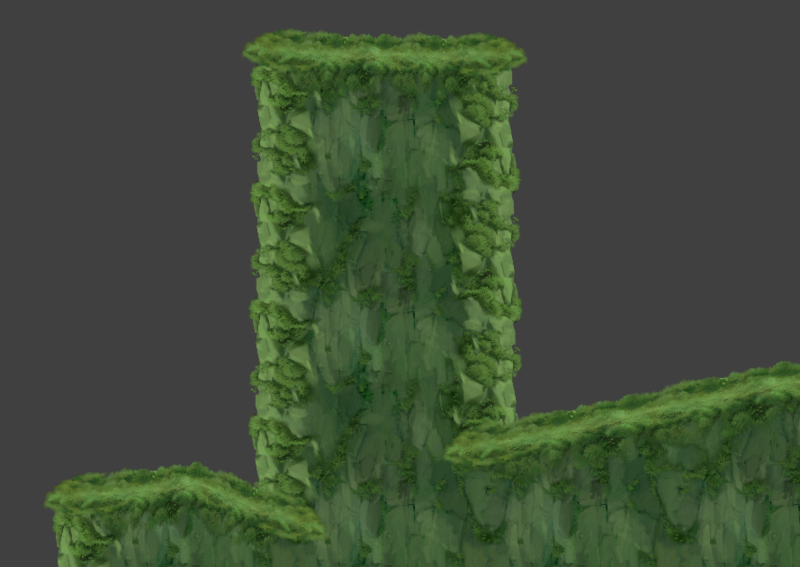 This will automatically create geometry with ledges, sides, bottom etc with different textures mapped to them which are also automatically scaled and tiled appropriately. 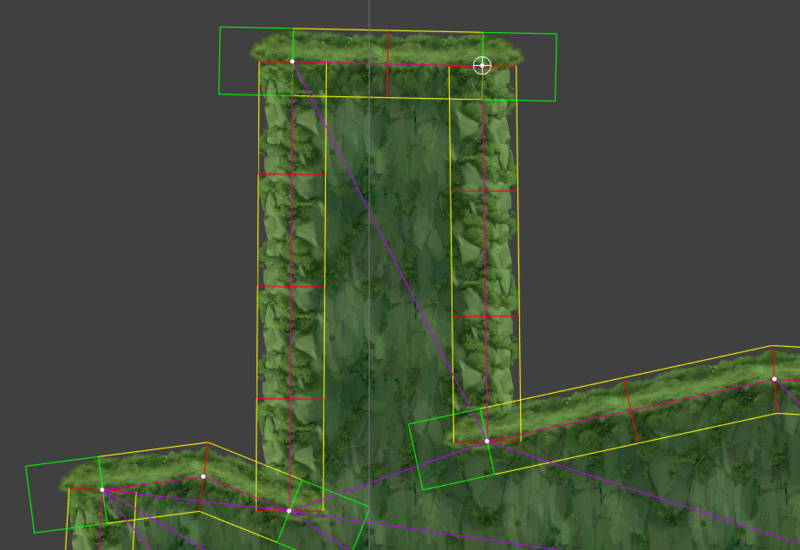 Obviously some issues can be seen here, some textures don't overlap, this will be fixed by connecting the meshes better. 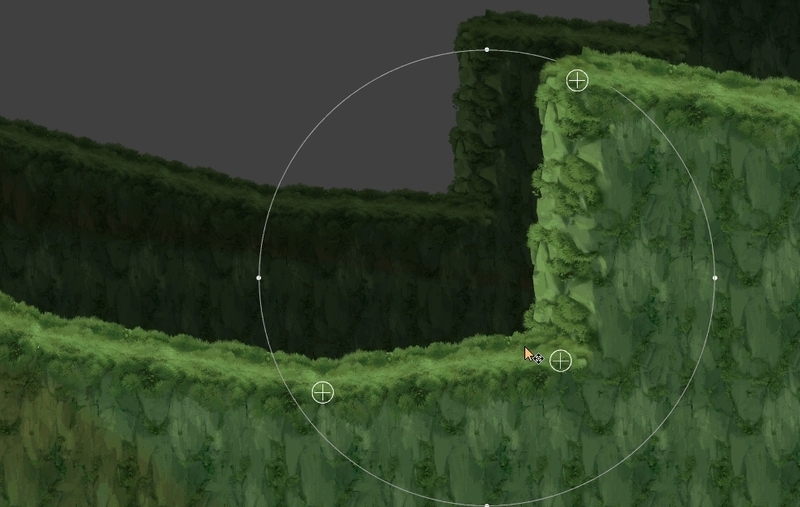 But as a start I have been battling a custom cam view to support editing directly in Duality. I can really see a potential for making level design a blissful experience using something like this. Originally got the idea from the UbiArt framework (rayman). It may need some more love before it is usable but I think it's a great start of something really useful! This must be a platformers level design dream. Will you put the Gfycat into the Showcase? Things have been moving along slowly but with steady progress. I decided to redo the whole mesh generation since it was kind of messed up. Now it is more configurable and should work better with different kind of texture setups. Margins can be manually set, and I also added miters for not so sharp corners so that uneven ground looks smooth and nice. Yellow lines are the generated quads. Pink lines are the actual path. Green lines are edge caps. Purple lines are the fill triangles. Next up is adding caps for the bottom parts and then refactoring some of the material setup. After that I think a first version should be ready to add to nuget as a duality plugin. It won't really be usable to a game for more than backgrounds as I have to rewrite the rigidbody stuff. But I think it's enough to get an idea of what I'm going for here. 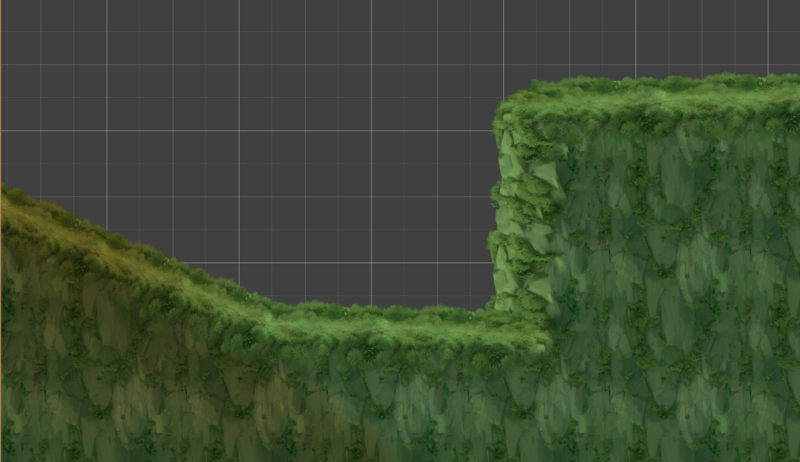 If I was a level designer, I would want the vertical cliff edge to be drawn on top of the near-horizontal "grass plane" down below, so it really looks like I'm running into a wall and not just past the edge "in front of a wall". I probably worded that badly - hopefully you still know what I mean? The thing is, if you changed this on a general level, then it would look wrong at the top where the grass being in foreground looks "right". The easiest thing to deal with this would probably be to define a new property for each "vertex" which kind of edge has the local priority, where the default value could be "DontCare", which would result in the algorithm deciding like it does now. Also, maybe optional corner caps? This is done by adjusting the offset of the caps. Of course, these settings would apply on the top part as well, but it all comes down to how you draw the textures really. It could of course be done, but I'm keeping it simple for now. Yep, I'm thinking the nodes will have additional information later on, but right now I'm trying to keep things simple. Another idea for that would be to manually set the "up"- vector for a specific node. Everything is actually optional right now, if you don't assign a material to side/top/fill/cap etc. that part won't be rendered. Wow that looks very cool! Is this editor available to the public/open source? I would love to try playing around with it. @skoggy, it looks really awesome! And the editor seems way better than what I've done. I like the 'select N vertices and then move/rotate as you wish' feature. Very useful. Also, the triangulation looks good, so I feel like @zakila. I'd love to try it.